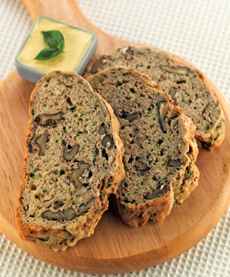 You can enjoy zucchini bread in a variety of delicious ways. Photo by Andrew Furlong | IST. According to Food Timeline, zucchini bread descends from a long line of European sweet vegetable puddings that date back to the Middle Ages. Carrot pudding is one of the oldest examples. Sweet potato pudding/pie followed during the Renaissance (source). Carrot pudding crossed from vegetable to dessert cake in the 20th century, and other vegetable-based desserts like sweet potato pie emerged. During World War II, zucchini had proved to be a prolific grower in American victory gardens. It remained in home gardens after the war, and recipes proliferated. Food historians point to the 1960s for the growth in popularity of zucchini bread. The hippie movement was in full swing, and hippies sought healthier foods. 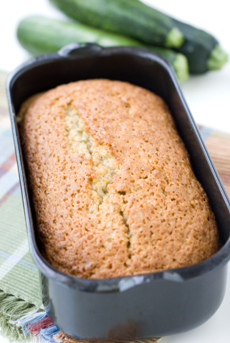 As an alternative to the sugary frosted layer cakes and sheet cakes, sweet quick breads like zucchini bread and carrot cake became popular, modeled after banana bread. Easy to make, portable, “healthy” and freezer-friendly they were promoted as “healthy” alternatives to standard desserts. Similarly, zucchini contains lutein, a phytochemical believed to protect vision. Baking with the optional whole wheat flour helps. But people liked it because it tasted good. Recipes for zucchini bread proliferate in the mid-1970s. James Beard published a recipe in 1973, in Beard On Bread. The recipe evolved to contain, chopped pecans or walnuts, and optional ingredients such as coconut, crushed pineapple, grated apple, raisins and sultanas, even chocolate chips. We enjoy it instead of a breakfast muffin. It’s perfect as a tea bread, plain or with cream cheese frosting. The loaves freeze well. You can cut slices from the frozen loaf and microwave for 10 seconds. Grated zucchini and its accompaniments (nuts, grated apple, etc.) can also be added to a yellow or chocolate cake mix. FOOD TRIVIA: Zucchini is not a vegetable but a fruit. It carries its seeds on the inside, like all other true fruits. Strawberries are an “accessory fruit” (previously known as a false fruit), a category where the fruit’s flesh is derived not from the ovary of the plant, but from some adjacent tissue. Other examples include figs, apples and pears. The strawberry is the only “fruit” with seeds on the outside. The “seeds” are actually incorporations of the pistils of the flower of the plant. *If you have extra grated zucchini, use it as a soup garnish or toss it into a salad. †For chocolate zucchini bread, omit the optional add-ins below except for the crystallized ginger option, either mixed in or used as a garnish. A tasty loaf. Photo by R. Tyree | IST. Preheat your oven to 350°F with a rack in the middle of the oven. Butter and the two loaf pans (or use a baking spray) and set aside. Or, line the pans with a parchment, leaving 2-3 inches hanging over the long side as to lift the zucchini bread out of the pan with ease. Combine the walnuts and add-ins (apple, chocolate chips, coconut, etc.) in a bowl. Set aside. In a large bowl, beat the butter until fluffy with a mixer. Add the brown and white sugars and beat until mixture is smooth, not crumbly. Add the eggs one at a time, mixing well. Scrape down the sides of the bowl with each addition. Add the vanilla. Squeeze excess water from the zucchini. Turning the mixer to Low, incorporate into the mix. In a separate bowl, combine the pastry flour, baking powder, baking soda, cinnamon and salt. Add half of the dry mix to the wet ingredients; incorporate, and add the other half. Fold in the add-ins with a spatula. Divide the batter equally between the two loaf pans and level with a spatula. Sprinkle crystallized ginger or chopped nuts on top. Bake for 40 minutes, or until a cake tester or toothpick comes out clean. Cool in pan for 15 minutes; then turn out onto a wire racks to finish cooling.